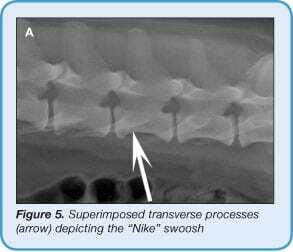 This is the third article in our Imaging Essentials series—a series focused on providing critical information on radiography of the dog and cat. Read the first two articles, Small Animal Thoracic Radiography (September/October 2011) and Small Animal Abdominal Radiography (November/December 2011), at todaysveterinarypractice.com. 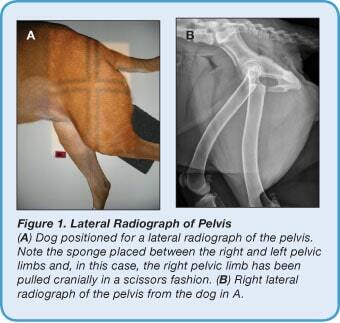 The purpose of this article is to review the three basic components of creating high-quality pelvic radiographs of the dog and cat, including positioning, technique, and quality control of the final images. Evaluation of congenital disorders (eg, hip dysplasia). For any dog measuring 15 cm or greater (measured at the iliac crest), a grid (8:1, 110 lines per inch) should be used. Grids are available from most radiology manufacturers and a grid tray comes with all radiology units. The techniques for the ventrodorsal and lateral radiographic projections of the pelvis are the same. For dogs measuring less than 15 cm or cats, a tabletop technique is preferred (no grid). If using direct or indirect digital radiography, then the imaging receptor remains fixed in the grid cabinet or within the table. If using a computed radiography system, the casette and imaging plate can be used in a tabletop fashion, similar to film screen combinations. A routine radiographic examination of the pelvis consists of two orthogonal radiographs, including a lateral image and an extended leg ventrodorsal image. The stifle joints (through the level of the proximal crus) are included in both images. For a lateral image of the pelvis, the patient is positioned on the table with the right side down for a right lateral image and left side down for a left lateral image. For cases, such as pelvic fractures or lameness, the side of concern should be the dependent side, which is placed closest to the table. A right lateral image of the pelvis is standard. The pelvic limbs should be taped separately with a sponge placed between them to ensure that the right and left hemipelves are aligned and directly superimposed. The pelvic limb that is closest to the x-ray table is taped in a cranial position, whereas the limb away from the table is placed in a caudal position so the pelvic limbs are in a scissor position, with the stifle joints separate and not overlapping (Figure 1). Start by setting the collimator light (field of view or FOV) to the same size of the cassette or detector by using the corresponding numbers next to the collimator knobs (see Small Animal Abdominal Radiography, November/December 2011). Then adjust the collimation to the actual size of the patient’s pelvis and pelvic limbs (typically smaller than the original collimator light setting). Cranial Border: Place the vertical center of the FOV along the axis of the greater trochanter (upper leg). The greater trochanter should be midway between the iliac crest and ischiatic tuberosity. The cranial border of the collimator light (FOV) should be placed cranial to the iliac crest. Caudal Border: The caudal border of the collimator light should be placed at the level of the ischiatic tuberosity or caudal skin margin in the perineal region. Dorsal Border: The vertical portion of the FOV should extend dorsal to iliac crest and greater trochanter (skin margin of dorsal pelvis). Distal Border: Adjust the horizontal center of the collimator light so that it is midway between the dorsal skin surface and distally includes the stifle joints and proximal crura. The patient should be placed in dorsal recumbency in a positioning V-trough (Figure 2). Using a V-trough helps keep the patient’s vertebral column and sternum aligned and the pelvis in a straight position. To avoid superimposed artifacts from the V-trough, the entire pelvis should be positioned past the edge of the trough and placed on the x-ray table. This positioning also helps decrease geometric magnification of the image. Tape the thoracic limbs together and pull them cranially to help align the vertebral column. This, in turn, will aid in keeping the pelvis straight. Each pelvic limb should be taped separately and extended evenly. Once the pelvic limbs have been extended, which typically requires the patient be adequately sedated, internally rotate the femurs so that they are parallel to one another and the x-ray table. When properly aligned, the patella for each pelvic limb will be centered within the trochlear groove over the distal femur. Secure the dog’s pelvic limbs in this position using tape around the femurs at the level of the stifle joint (Figures 2A and 2B). Use the same procedures for setting the collimator light as described earlier for lateral images. Cranial Border: The cranial border of the collimator light (FOV) should be placed cranial to the iliac crest. Palpate the iliac crests and place the cranial edge of the collimator light just cranial to this level. Caudal/Distal Border: The caudal/distal border of the collimator light should be placed just distal to the stifle joints to allow the proximal crura to be included in the image. Lateral Borders: Close the collimator light laterally so the light is next to the skin on both the right and left sides. Add a film marker (R/L) for identifying the right or left side prior to exposure. 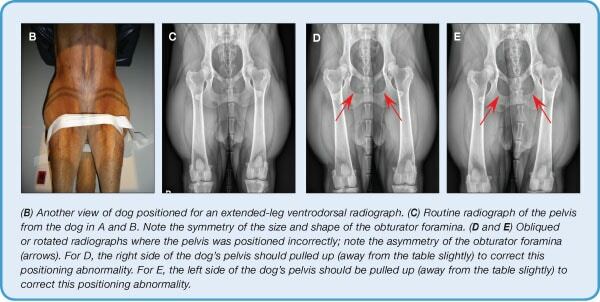 Dogs and cats with severe coxofemoral degenerative joint disease or fractures of the pelvis, femoral head/neck, or femur are not physically able to extend their femurs in the standard extended-leg ventrodorsal position. In this case, a frog-leg ventrodorsal image can be used for initial assessment. It addition, in dogs or cats with capital physeal fractures of the femoral head, extending the limbs into the routine position can actually reduce the fracture and render the fracture indistinguishable from the normal limb. In this case, the frog-leg ventrodorsal image should be used to confirm the fracture. Use a V-trough to help keep the patient’s vertebral column and sternum aligned (Figure 3). As with standard ventrodorsal images, avoid superimposed artifacts caused by the V-trough by placing the entire pelvis past the edge of the trough onto the x-ray table, which also decreases geometric magnification. Tape the thoracic limbs together and pull cranially to help align the vertebral column that will, in turn, aid in keeping the pelvis straight. Place the pelvic limbs in a natural flexed position so that the femurs are at approximately ninety degrees to the spine and pelvis. Cranial Border: The cranial border of the collimator light (FOV) should be placed cranial to the iliac crest based on palpation. Caudal Border: The caudal border of the collimator light should be placed just caudal to the ischiatic tuberosity. Lateral Borders: Close the collimator light laterally so the collimation includes at least the mid to distal femoral level. The stifle joints will need to be radiographed separately as necessary. Add a film marker (R/L) for identification of the right or left side prior to the exposure. Educate and establish control programs to lower the incidence of these diseases in animals. 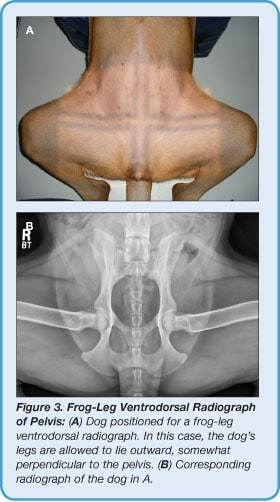 For hip dysplasia certification, OFA requires a straight, extended-leg ventrodorsal view of the pelvis. The femurs need to be extended and parallel to each other; the stifle joints need to be rotated internally so the pelvis is straight and symmetric (Figure 2). Chemical restraint is recommended to ensure a high-quality radiograph the first time and avoid repeats at the owner’s expense. For more detailed information regarding OFA certification, registry, details on radiographic requirements, and forms, veterinarians and/or technicians can visit offa.org. In 1993, Dr. Gail Smith from the University of Pennsylvania School of Veterinary Medicine established the Pennsylvania Hip Improvement Program (PennHIP) distraction technique as a method for assessing coxofemoral joint laxity. A distraction flexed pelvic limb ventrodorsal view (Figure 4). This last projection requires use of a specialized distraction frame apparatus that is made available to trained and certified PennHip members. Specific details regarding PennHIP evaluation can be found at pennhip.org. Determine if the technique is appropriate. Ascertain if the appropriate anatomy is present within the image. Check the correct anatomic positioning for laterality and straightness. Given that the desired technique has been attained, make sure that the appropriate anatomy is included: the lateral and ventrodorsal projections should include the cranial aspect of the iliac crest, pelvis, coxofemoral joints, and the proximal tibia, including the stifle joints. The transverse processes of the caudal lumbar vertebrae should be superimposed to determine if a patient is in a true lateral position. The right and left sides should form a single “Nike” swoosh (Figure 5). 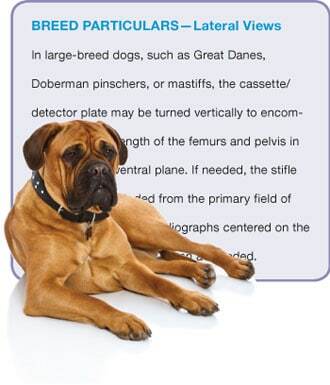 Remember that in the larger dog, due to magnification, the iliac crest and femur furthest away from the cassette or detector will appear larger than the recumbent side. The ischia should be superimposed on the lateral projections; the dorsal acetabular rims should be superimposed. Each caudal lumbar spinous process is viewed end-on and has a distinct diamond or tear-drop shape. The obturator foramina should be symmetrical in shape and equal in size. The femurs should be parallel to each other. The patellas should be superimposed over the distal femoral trochlear groove in a normal dog. If the dog or cat has luxation of the patella, the patella may be laterally or medially displaced relative to the distal femur. The lateral aspects of the ischiatic tuberosities will overlap evenly along the medial aspect of the proximal femurs (Figures 2C, page 49, and 4A, page 51). 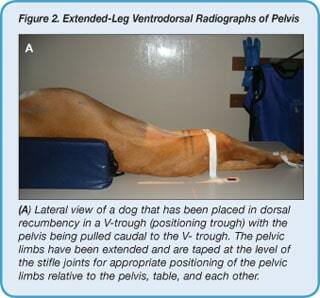 Evaluation of congenital disorders (eg, canine or feline hip dysplasia). High-quality, correctly positioned radiographs are required in order to provide an accurate assessment, especially for surgical implant planning. A routine radiographic series of the pelvis should include a lateral and ventrodorsal view. Choosing the lateral projection used depends on the side of lameness and whether pelvic or femoral fractures are present. If the pelvic examination is routine, a right lateral of the pelvis is standard. Following a consistent, repeatable pattern for obtaining pelvic radiographs ensures the quality of the images will be diagnostic. Keely JK, McAllister H, Graham JP. Diagnostic Radiology and Ultrasonography of the Dog and Cat, 5th ed. Philadelphia: Saunders Elsevier, 2011. Suter PF, Gomez JA. Diseases of the Thorax–Radiographic Diagnosis. Ames, IA: Iowa State University Press, 1987. David J. Reese, DVM, Diplomate ACVR, is clinical assistant professor in diagnostic imaging at the University of Florida College of Veterinary Medicine. His research interests include cross-sectional imaging of small and large animals as well as diagnostic imaging of exotic animal species, especially aquatic reptiles and mammals. Dr. Reese received his DVM from University of Florida and completed a radiology residency at Ohio State University.